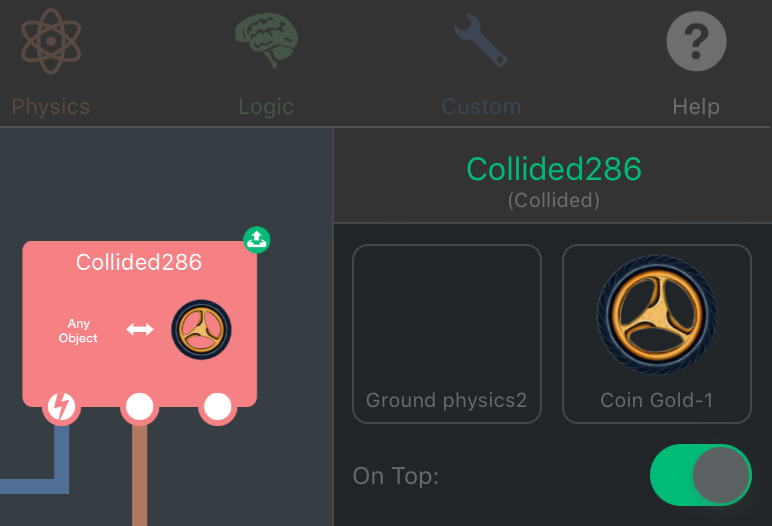 The first item in Collided should be itself (wherever the Collided Behaviour exists). That's how I'm using it. @Deeeds I’m gonna guess that your object “Ground physics2” is either completely invisible or it’s just so long in one direction but not the other (i.e a REALLY long beam) that the display box can’t even represent it as a line of pixels, so it just comes up empty and says Any Object. I don’t think it actually affects anything though. @Aidan-Oxley It has an impact. I have to question my code. Again. And it is a bug. Why do you constantly want to pretend everything is alright? This is a bug. I'm reporting it. It caused me consternation and confusion, made me need to test and verify that it was working, and makes me nervous that it's going to stop working at some point, so I have to make a mental checkmark of where and what this possible area of issues is/are. Regardless of what I'm doing, it should say what is in the box, not what it's currently saying. @Deeeds normally it says “any object” if an object hasn’t been selected. If it is showing it when an object is selected, then I agree it’s a bug. @Deeeds Well, that never happened to me. What did you do to cause it? @GameCRAZY It's my fault. Right? @Deeeds I didn’t mean everything is fine, I meant it doesn’t really have an impact on how your project runs, it just looks weird and wrong. I don’t know why it says “Any Object” rather that just showing nothing If an object is too long and thin to display in that small box. I don’t know why it says “Any Object” rather that just showing nothing If an object is too long and thin to display in that small box. BECAUSE IT IS A.... BUG! @Deeeds Well, not necessarily. You just have to elaborate on what caused it because it certainly won't happen every time. @GameCRAZY Aidan has done that, and apprently files bug reports, too. And apparently Hamed has a list of bugs. Do you remember if there was anything you did that lead up to this? Ie. Duplicated the behaviour, duplicated object. etc.? @Murtaza As per Aidan's comment. It's a very long, very thin object. A ground plain. @Murtaza here's an example project: http://bit.ly/2rB7BMp (the behaviour is inside the thin white bar). I'm guessing it happens when the object is too thin to actually draw any pixels inside the preview. Maybe replace it with the "Object" text that appears when an object's asset is deleted.